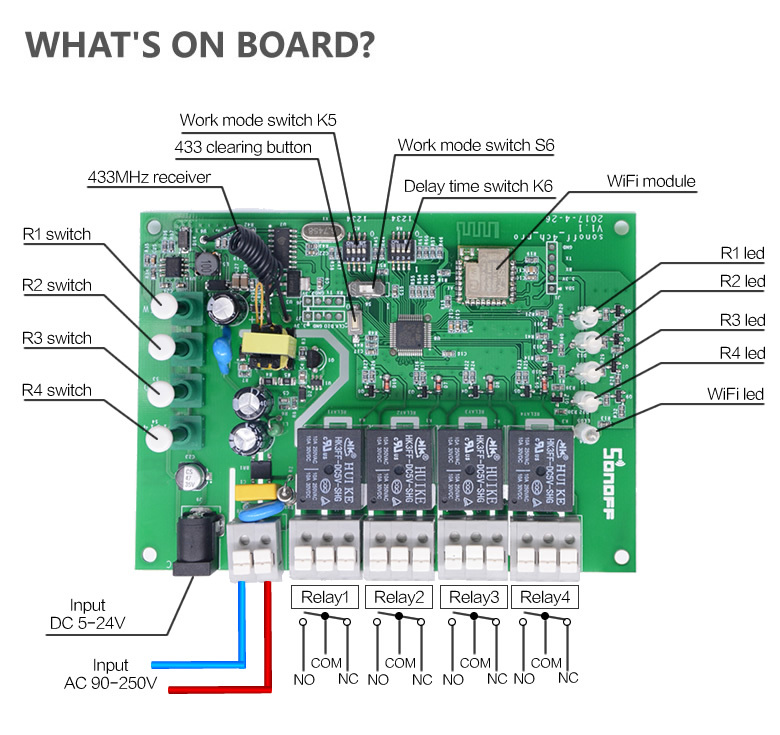 Hi, welcome to use Sonoff 4CH Pro! 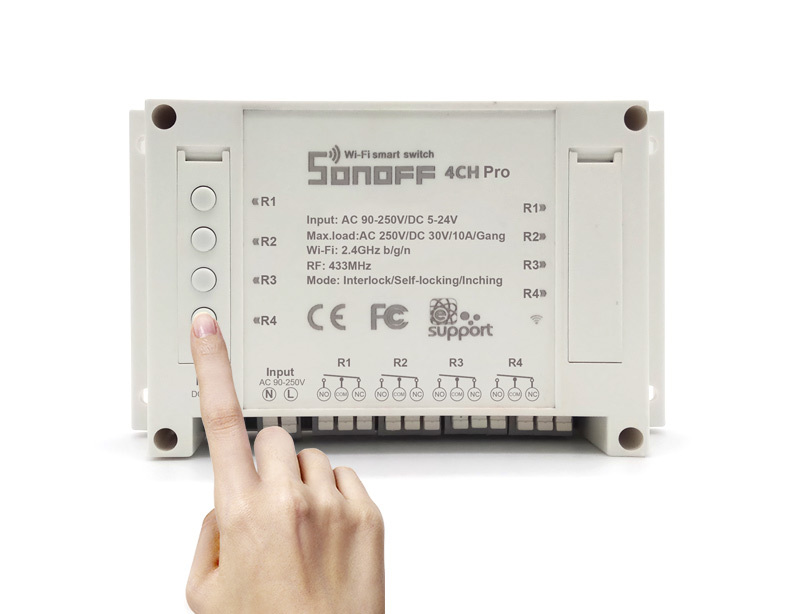 Sonoff 4CH Pro is a 4 channel din rail mounting 433MHz RF remote WiFi switch that can independently control the 4 home appliances. It supports switching among 3 working modes: inching/interlock/self-locking mode. Power supply: 90-250v AC(50/60Hz)/5-24v DC. Max current: 10A/gang. 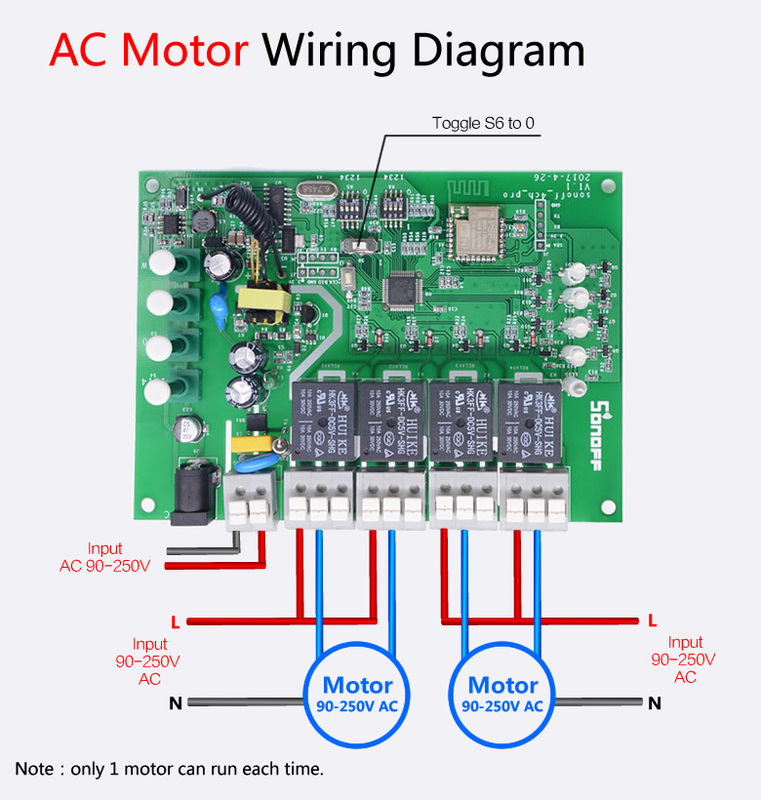 You may choose to power up by 5-24V DC or by 90-250V AC. Each relay without voltage output. R1-R4 work as local control switches, you can directly press it to turn on/off the corresponding gang. They also work as pairing button. 1. Power up your device through 90-250v AC(50/60Hz) or 5-24v DC. 2. Press and hold one of the 4 switch buttons for 7 seconds until the wifi LED fast blinks 3 times and repeats. 3. Click the “+” icon on eWeLink to search device, select the corresponding pairing icon, click next. 4.1 If your WiFi doesn’t have a password, keep it blank. 5. Next, the device will be registered by eWelink and add it to your account，it takes 1-3 minutes. 7. Maybe the device is “Offline” on eWeLink, for the device needs 1 minute to connect to your router and server. When the wifi LED is on, the device is “Online”. You can set the switch among 3 working modes: inching/interlock/self-locking mode. 1. In self-locking mode, you can turn on/off the 4 connected devices independently. For example, if you turn on CH1, connected device keeps on. If you turn off CH2, connected device keeps off. 2. In inching mode, you can turn on the connected devices for 1-16s . For example, you can turn on CH1 connected device for 1s, then auto-off. 3. In interlock mode, you can turn on 1 device every time, and turn off other devices at the same time. For example, if you have turned on CH2, then when you turn on CH3, CH2 will be auto-turned off at the same time. As you can see from the image, there are S5, S6, K6 and K5. CAUTION: Please cut off the power supply before switching S5, S6, K5, K6. Whether you use DC or AC input, make sure you have unplugged the power plug every time!!! It’s very dangerous if you don’t cut off the power supply, and the new settings cannot be activated. S6 is interlock /inching&self-locking switch: Toggle to the right(0), it enters into interlock mode; Toggle to the left(1), it enters into inching &self-locking mode. 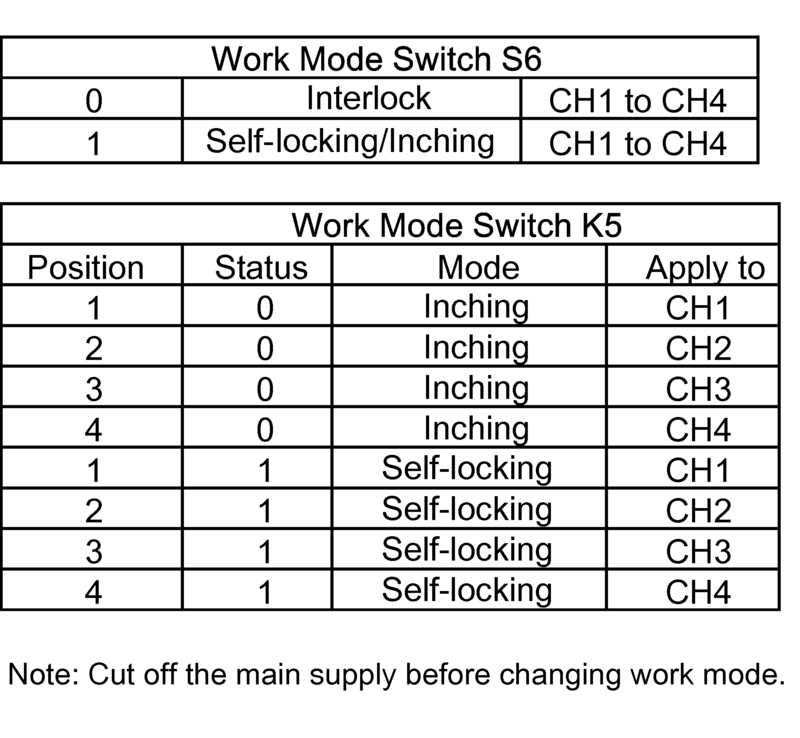 K5 is inching/self-locking switches: From left to right, there are 1, 2, 3, 4, correspondingly for channel 1 (CH1), channel 2 (CH2), channel 3 (CH3), channel 4 (CH4). Toggle the switch down (0), the corresponding channel enters into inching mode; Toggle the switch up (1), the corresponding channel enters into self-locking mode. Please note that if S6 is toggled to the right(0), your 4CH Pro is in interlock mode, it’s invalid to set K5. K6 is used to set the delay time for inching mode. From left to right there are 1, 2, 3, 4, correspondingly for CH1, CH2, CH3, CH4. 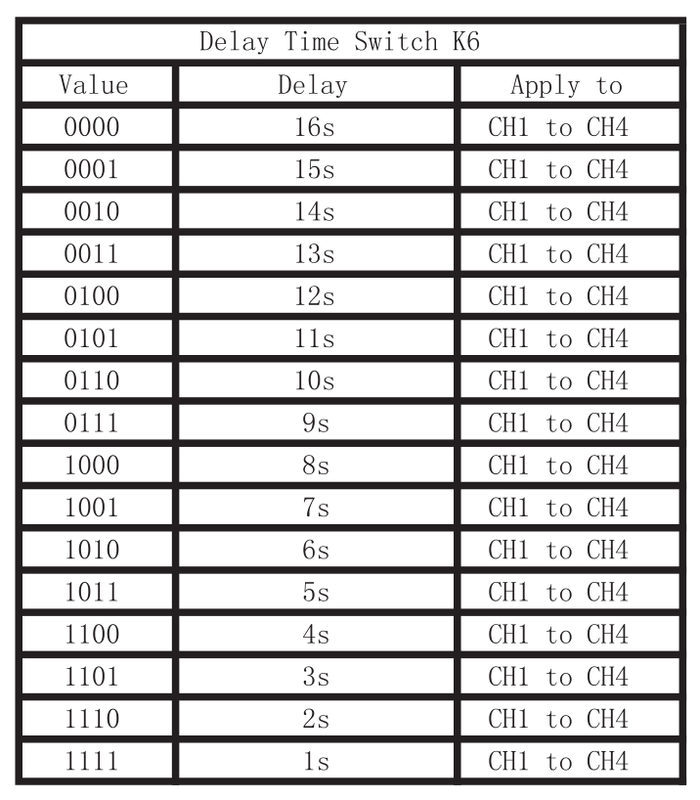 Take Sonoff 4CH Pro for example, toggle all switches down (0000), the inching time will delay for 16s; Toggle all switches up (1111), the inching time will delay for 1s. 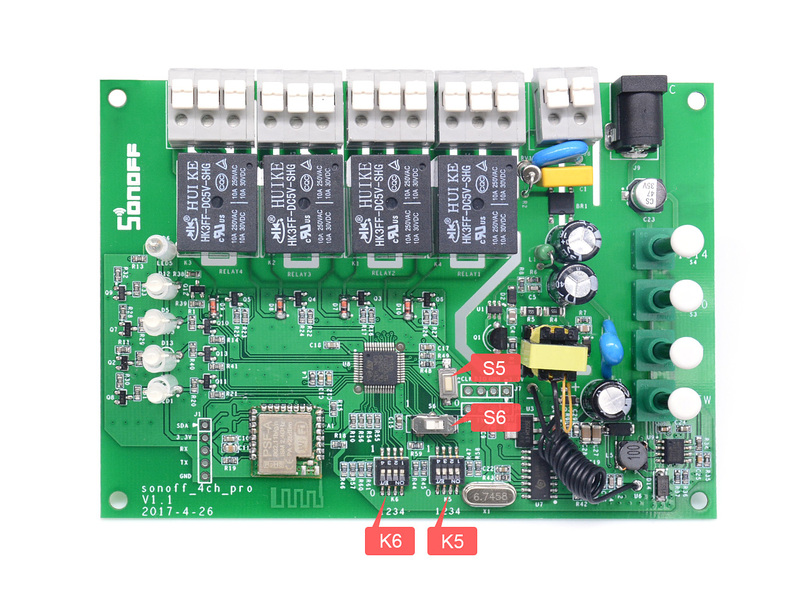 Learn with 433MHz RF Remote：Each gang can supports 1 RF key, which means each gang can only remember the RF key learned last time. Quickly press twice one of the switches below, then press one of the ABCD buttons on your RF Remote. If learned successfully, the button will lit up in red, and the corresponding status LED will blink in green for 4 times. You can press the button to turn on or turn off the corresponding channel. Clear 433MHz Coding: S5 is 433MHz code clearing button, please press and hold it until the 4 LEDs lit up green and off. 1. 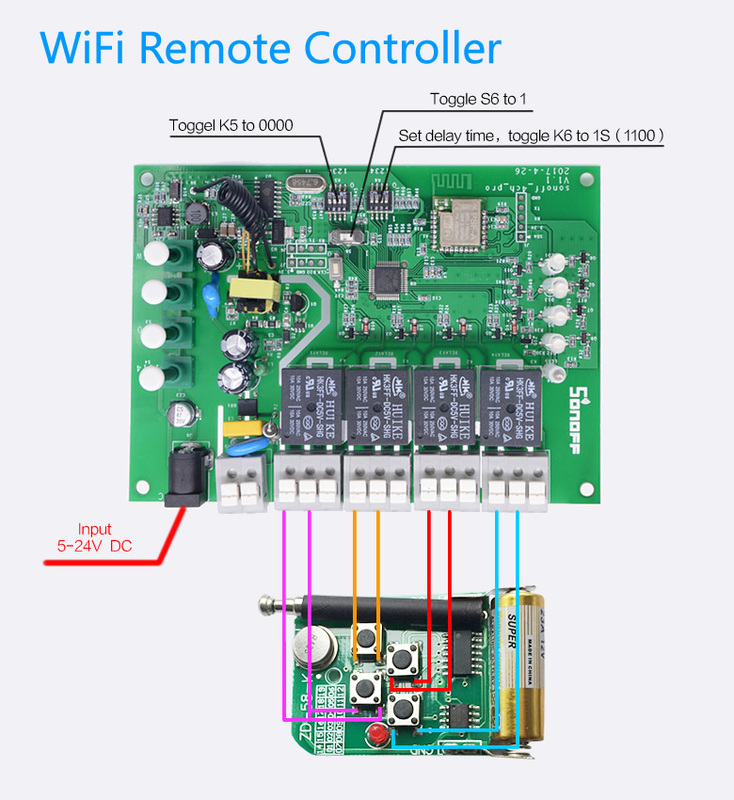 Use WiFi to remote control 4 devices separately. Turn on/off by tapping on device icon. Device status will simultaneously display on the interface. How to make it possible? Firstly click Share, input the eWeLink account (phone number or email address) you want to share, tick the timer permissions (edit/delete/change/enable) you want to give, then click Next. The other account will receive an invitation message. Click Accept, the device has shared successfully. The other account will have access to control your device. 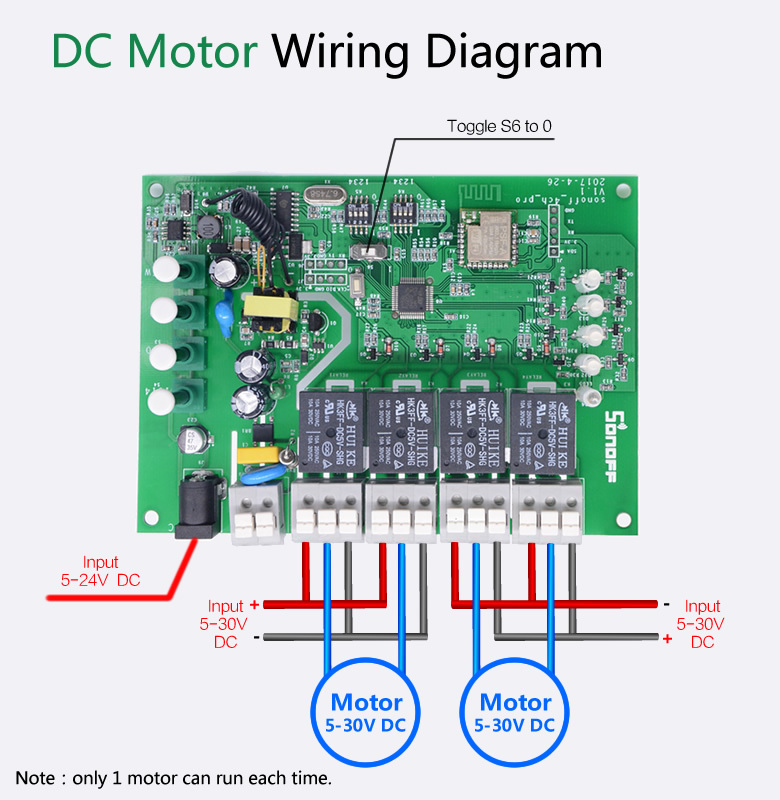 Supports max 8 enabled single/repeat/countdown timer to auto-turn on/off connected appliances. Scene allows triggering on/off your devices automatically. Scene Settings is in the upper right corner of Device List. You can set up scenes or smart scenes to trigger on/off Sonoff 4CH Pro. 1.1. Wifi led quickly blinks one time and repeats, which means device failed to connect to the router. The reason may be you have entered wrong WiFi password or your device is too far away from the router, which causes a weak WiFi signal. The device can not be added to the 5G-wifi-router, only the 2.4G-wifi is OK. At last, make sure that your router is MAC-open. 1.2. Wifi led slowly blinks one time and repeats, which means the device has connected to router and server but failed to be added to device list. Then power on the device again, if it still not working, just add the device again. 1.3. Wifi led quickly blinks twice and repeats, this means the device has connected to the router but failed to connect to the server. Then please confirm your WiFi router works normally. 2. Why the APP can not find the device in pairing status? Answers: Currently this product does not support LAN or directly connect to hotspot. It must connect to the WiFi router with a normal network that can visit the Internet. 4. The wifi led keeps off, even if the device is powered on. Press the button but the device does not work.